In large bowl, beat Cake ingredients with electric mixer on low speed 30 seconds, then on medium speed 2 minutes, scraping bowl occasionally. Divide and spread batter evenly in pans. Bake 30 to 35 minutes or until toothpick inserted in centre comes out clean. Cool 10 minutes on cooling rack; remove from pans. Cool completely, about 1 hour. Place 1 cake layer top side down on cake stand or plate. Spread with 1/3 cup of the ganache. Top with second layer, top side up. 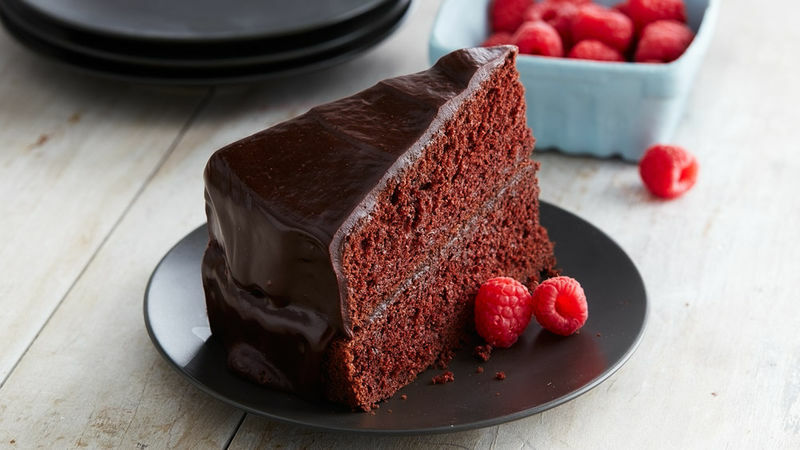 Pour remaining ganache carefully onto top centre of cake; spread with large spatula so it flows evenly over top and starts to drip down sides of cake. Let ganache set before cutting. Serve with strawberries.